Start 2019 off on the right foot and begin to work towards your Contents Loss Specialist (CLS) Certification. Obtain RIA's CLS certification, which is one of the four pillars of the enhanced Certified Restorer (CR) program, by attending the CLS Prep Course and Exam. Why: The course assists Contents Restoration Specialists across the country and internationally. A training program that is not only top of the line as far as content, but also brings a systematic approach to the way contents are dealt with in general. Don't miss your chance to participate in the CLS Prep Course and Exam taking place next month! Questions? Visit our website or contact certification@restorationindustry.org. Please note: Attendees of the December course have been granted an extension in completing the CLS pre-requisite requirements until December 2019. However, CLS marks cannot be used until all pre-requisites are completed. The full pre-requisite requirements and submission process is available here. For more information, contact ldombrowski@restorationindustry.org. 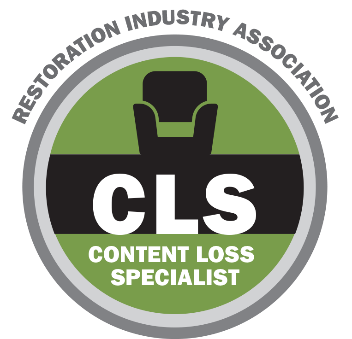 Be Among the First to Earn Your Contents Loss Specialist (CLS) Designation!